From the beginning of primary season, many voters seemed to have limitless interest in the twists and turns of the 2008 presidential and other races. This fascination manifested itself in numerous ways, from record numbers of citizens following election news and tracking the progress of the race to extensive waiting-lines on polling day caused by high voter turnout. This upswing in interest in the political process was inspired by many factors: a tightly-contested Democratic primary between Barack Obama and Hillary Clinton that extended well into the spring; an open Republican primary without an incumbent running for president; a general election featuring the first African-American major party candidate and one of the most well-known Republican Senators; a general election season that overlapped with the collapse of the housing market and banking sector; and a political climate in which there was widespread dissatisfaction among voters with the overall direction of the country. Voters frequently turned to technology to help them stay up to date with campaign developments, express themselves politically and encourage others to vote for their candidate of choice. While usage of the internet for political purposes has been steadily growing over the last decade, the online political experience was qualitatively different this year than it was in 2000, 2004 or even 2006, as many social media features that were in their infancy during the previous presidential race had become commonplace by 2008. These two factors—increased interest in politics combined with greater opportunities for online political involvement—met head-on during the 2008 campaign. The result was an upsurge of political content, chatter and mobilization in various online venues. Put simply, voters in 2008 were not just passive followers of the political process. They also used a wide range of digital tools and technologies to get involved in the race, to harness their creativity in support of their chosen candidate, and to join forces with others who shared their same political goals and interests. In this report, we look at the results of a national post-election survey that focused on the role that the internet and cell phones played in the 2008 race at all levels. In addition to updating participation in various online activities that we have tracked since the Project’s earliest political surveys in 2000, this survey examined the role of social media tools in an effort to place them in the context of the overall online political debate. More than half of all adults used the internet to get involved with politics in one way or another this past election season. The internet passed a significant marker in the 2008 election season, as more than half of the entire adult population (internet users and non-users alike) went online to learn about the campaign or get involved in the political process. We define engagement in the online political environment using three separate metrics. First, we asked members of the wired population whether they went online for news and information about politics during the 2008 election season. Six in ten internet users (60%) said that they had done so at least occasionally over the course of the campaign. Next, we asked whether they used the internet to communicate with others about the campaign and 38% internet users said that they had done this. Indeed, nearly one in ten internet users went online to talk politics on a daily basis during campaign season—5% did so every day and an additional 4% said that they did so multiple times a day. Finally, we asked whether they had gotten campaign information or communicated with others about politics using specific tools such as email, text messaging, instant messaging or Twitter. All told, six in ten internet users (59%) received or shared political information over the course of the campaign using one or more of these technologies. While the overall size of the online political user population is notable in its own right, it is also striking to observe the broad base of demographic groups it represents. To be sure, certain demographic cohorts contain a relatively small number of online political users: For example, 22% of all adults age 65 or older and 31% of those with a household income of less than $30,000 per year took part in the online political process this year. However, this is largely due to the fact that these groups are relatively unlikely to go online in the first place. Among those who go online, more than half of most major demographic subgroups (seniors, African Americans, etc) were politically engaged online in one way or another this election season. Another way to examine this issue is to compare the demographics of the online political user population to that of all internet users and to the adult population as a whole. 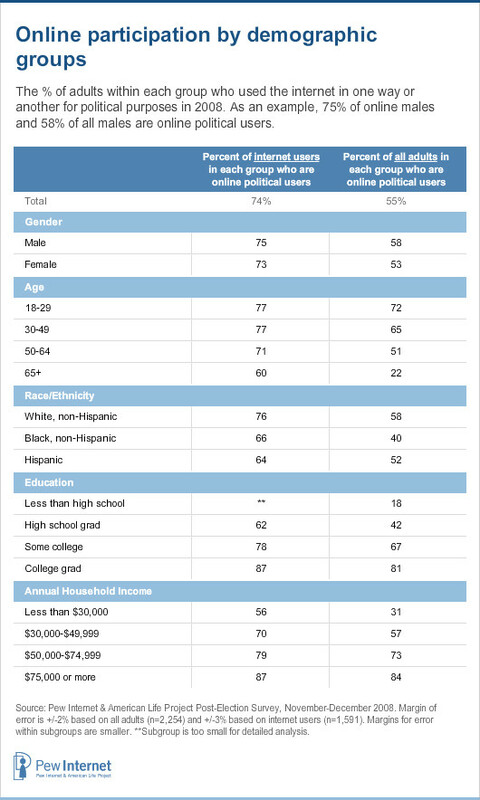 When viewed in this manner, one can see that online political users are similar in their demographic composition to these other groups with respect to gender, race and geography. On the other hand, the online political user audience is indeed younger, and has greater levels of income and education, than the population as a whole. Email and text messaging continue to develop as tools of political communication. Email and text messaging continued to integrate themselves into voter’s political communication and information gathering habits in 2008. Six in ten (59%) email users exchanged emails about the campaign and 39% of cell-phone owners used text messaging to communicate with others about the race. Some 17% of email users exchanged emails about the race every day, and 8% of cell owners texted about the race every day during this year’s campaign. Generally speaking, email and text messaging were used more often this election season for sharing and communication than for information gathering. This is especially true for text messaging: While one in ten (11%) text messaging users got text messages directly from a candidate or political party this election cycle (1% on a daily basis), more than one-third (36%) used mobile text messaging to communicate with friends, family members or others about the state of the campaign (with 8% doing so daily). With email, the trend is less strong but points in the same direction: nearly half (47%) of email users shared political emails with their friends and family over the course of the campaign (9% daily) compared with the 37% who got email directly from a candidate or political party (11% daily). 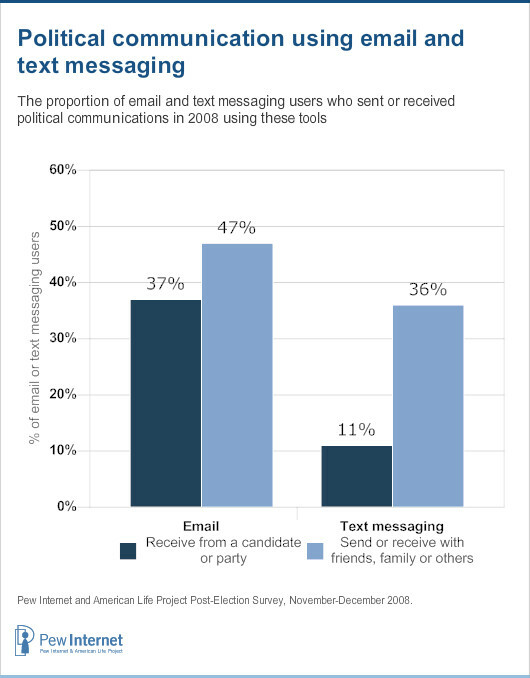 Voters used other technologies over the course of the campaign to chat with friends about the election, although email is by far the most popular. For instance, 34% of instant messaging users used IM to talk with friends or family members about the campaign. This works out to 10% of the entire adult population who communicated about politics over IM in 2008. Additionally, 19% of Twitter users used Twitter to post their thoughts or experiences about the campaign, although this comes to a relatively small number of people given the low incidence of Twitter users in the population as a whole. When all of these methods of political communication are placed into the context of the entire adult population, email clearly emerges as the dominant mode of digital political communication, followed by text messaging and IM. 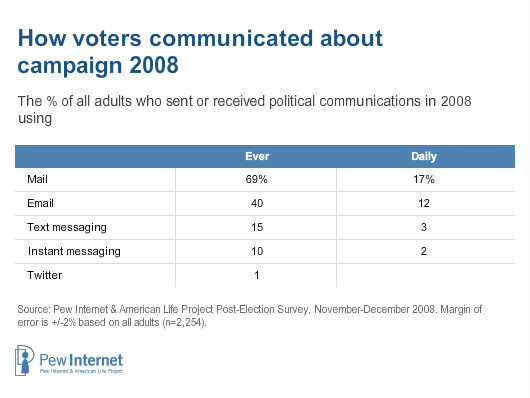 Fully 40% of all adults engaged in some type of email-based political communication in 2008, with one in ten doing so on a daily basis. View it, customize it, pass it along – the activities online political users engaged in this election cycle. Online political users went online for a range of reasons this election season, from watching political videos to donating money or volunteering for campaign activities. Here are some of the activities in which they engaged online. Fully 57% of online political users (representing 42% of all internet users) went online this election season to get information about the candidates’ positions on the issues or about their voting records, making this activity one of the most common outside of looking for election news. This type of political information gathering is also widely dispersed throughout the online politically engaged population, even among those who are not typically highly engaged in the online political debate. For instance, among online political users 45% of those with only a high school education went online for candidates’ voting records and stances on issues, as did 47% of those earning $30,000 or less per year. Like email for the general population, going online for basic candidate positions and voting histories seems to offer an entry point for access to the world of online politics. Our wording of this question has evolved over time, making direct comparisons across election seasons somewhat problematic. However, it does appear that the size of the population looking for basic candidate information has grown since the last presidential election cycle. In 2004, 31% of internet users said that they had gone online for information about the candidates’ positions on the issues, compared with the 42% this past election cycle who went online for information about the candidates’ positions or voting records. While just 10% of internet users did this in 2000, our question wording at that time referred only to looking up voting records, and not the more general issue of the candidates’ issue positions. By the end of the campaign, fully 60% of online political users (representing 45% of American internet users) had gone online to watch some sort of video related to politics or the election. A great deal of this video-watching involved “official” online videos from either a campaign or a new organization, as 50% of online political users watched these types of videos over the course of the campaign. However, unofficial (often user-generated) content was nearly as popular: 43% of online political users watched videos that did not come from either of these two sources. Young adults are leading the way in their consumption of online video. Among online political users, 57% of 18-29 year olds watched online videos from a campaign or news organization and 54% watched video from sources other than the campaigns or traditional media. In total, two-thirds (67%) of online political users age 18-29 watched some form of online campaign video this election season. This equates to nearly half (48%) of all 18-29 year olds (political users and non-users, online and offline alike) who watched online political videos in 2008. 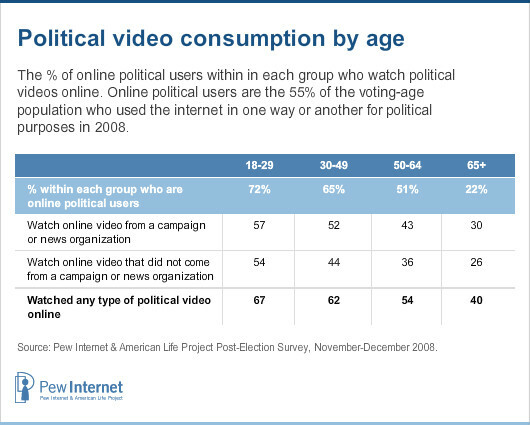 Members of the under-30 age group are the most intense online video watchers, but older voters hardly shunned online video. Six in ten online political users age 30-49 watch online political videos—this represents 41% of all adults in this age cohort. Voters also took advantage of tools such as RSS feeds and email alerts to get customized political news tailored to their specific interests. 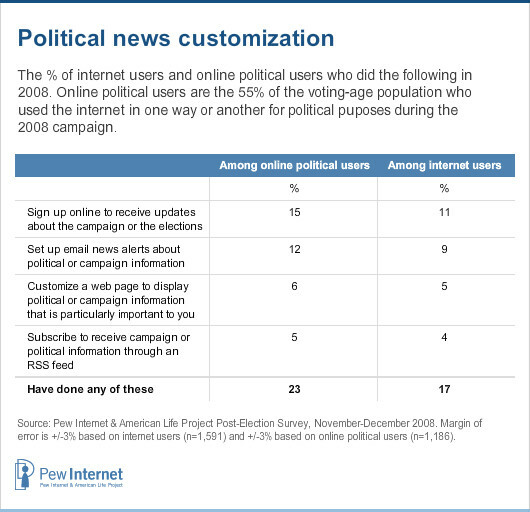 In total, nearly one-quarter (23%) of online political users went online for customized news about politics or the 2008 election. This represents 17% of all internet users. Younger voters (particularly those under the age of 30) took great advantage of the ability to customize their news and get the latest updates on the campaign. Among online political users age 18-29, 21% signed up online to receive updates about the campaign, 12% customized a web page to display political information tailored to their interests, and 8% set up a politics-related RSS feed. Users of various social media applications were also interested in obtaining timely customized information—perhaps so they could be the first to share them with their friends—with Twitter users leading the way. Compared with other online political users, Twitter users were much more likely to sign up online for updates about the election (26% did this, vs. 14% of non-users) and to subscribe to political RSS feeds (14% vs. 4%). Minority voters also show a strong affinity for having customized political news delivered to them. Among online political users fully one-quarter (25%) of African-Americans and English-speaking Hispanics6 signed up to receive online updates about the election; 23% of blacks set up political email news alerts; and 18% of Hispanics set up a customized web page to show them especially relevant political information during the campaign. In each case minorities are significantly more likely to do these activities than whites, although due to the relatively small number of black (n=84) and Hispanic (n=70) online political users in our survey, these results should be interpreted with some caution. In contrast to online video (which already had high levels of usage at the time of our May 2008 pre-election survey) political content sharing experienced significant growth over the course of the 2008 race. 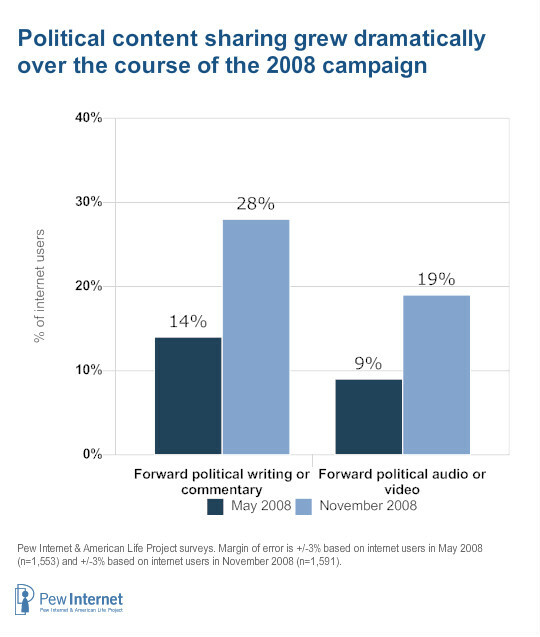 Compared with our pre-election survey conducted in May 2008, voters in the final stages of the campaign were far more likely to have forwarded both written political commentary and political audio or video recordings to their friends. Also notable is the extent to which older Americans took part in sharing and passing along political links and commentary during this election cycle. Among those age 65 and older who engaged in the online political process, fully 41% forwarded political writing or commentary to their friends and family, and an additional 32% forwarded on political audio or video recordings. This is likely related to those seniors’ familiarity with email as a tool for non-political communications with friends and family members—while younger adults dominate political video and using social networking sites for political purposes, seniors more than hold their own in keeping the political conversation going via email. In an election featuring the first African-American general election candidate for president, African-American voters were excited to share photos, audio or video files with their friends and family. Fully 39% of black online political users did this during the campaign, significantly higher than the figure for whites (20%) or Hispanics (22%). However, as noted above the number of African-American online political users in our survey was relatively small (n=84) so these results should be interpreted with some caution. Many of the online activities discussed here led to engagement in traditional forms of political activism. Indeed, they were designed for this purpose. One in ten online political users (11%, representing 9% of internet users) went online to contribute money to one or more candidates for office and 8% (6% of internet users) went online to sign up for volunteer activities related to the campaign—such as helping to register voters or helping get people to the polls. Not surprisingly, donating money online is mostly the province of older, college-educated and higher-income voters, although younger adults are much more likely than other age groups to volunteer online to help out a campaign or candidate. 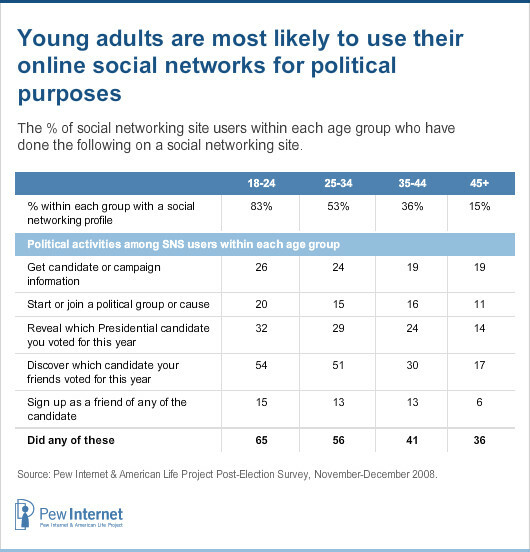 Fully 14% of online political users age 18-29 volunteered online, compared with 6% of 30-49 year olds, 8% of 50-64 year olds and 5% of those ages 65 and older. 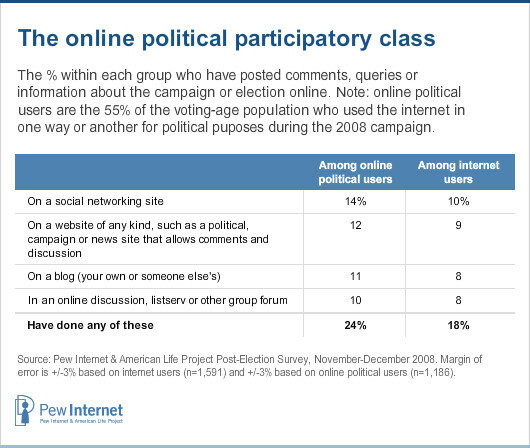 Nearly one in five internet users is a member of the political participatory class. Over the course of the 2008 election, many voters took advantage of the two-way flow of communications offered by new internet technologies to become active participants in the online political debate. One-quarter (24%) of online political users (representing 18% of all internet users) contributed to the online political debate this election season by posting their questions, comments or commentary where others could read them. Among demographic groups, young voters are by far the most likely to post their own political content online. 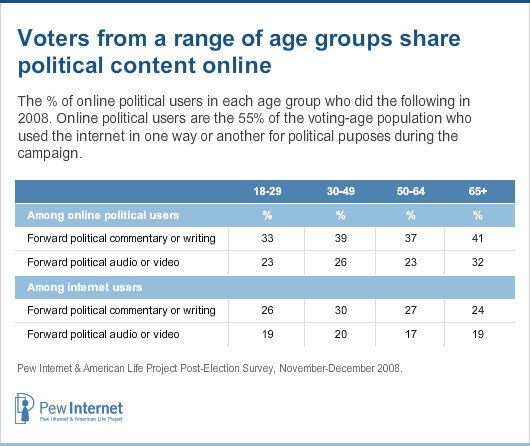 Fully 40% of online political users age 18-29 are online content creators compared with 21% of those age 30-49, 17% of those age 50-64 and 9% of those age 65 and older. 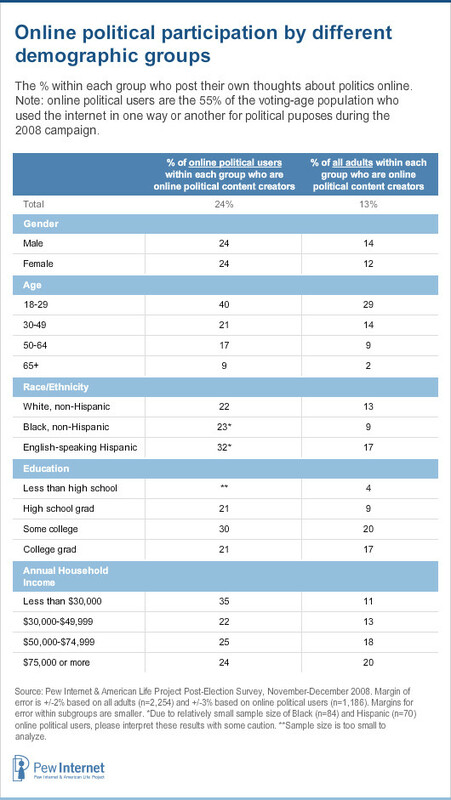 Put another way, more than half of all online political content creators are under the age of 35, and 30% of these individuals are younger than 25 years old. In a related finding, students are also devoted political content creators—44% of online political users who are currently enrolled as students (whether full- or part-time) post their own political commentary, compared with 20% of those who are not currently enrolled in school. Since all online content is often generated to create conversation and debate, there is also a high level of correlation between the use of various social media applications and posting one’s thoughts about politics online. Among online political users, fully 46% of those who use Twitter or other status update services post their own original political content online (vs. 22% for non-users) as do 41% of online political users who use social networking sites (vs. 12% for non-users) and 34% of those who watch political videos online (vs. 9% for non-watchers). Each of these technologies serves as a platform for information gathering, sharing and content creation. Online social networking sites served as a hub for sharing political interests and affiliations with friends. Young adults are more likely than older adults to use social networking sites in general,7 and even within the universe of social network users young adults (those under the age of 30) use these sites much more intensely for political purposes.